SNHR has released its report that documents violations against media workers by all parties to the conflict in Syria. The report notes that all of the parties to the conflict have oppressed journalists and citizen journalists to varying extents, committing crimes qualifying as war crimes against them. The Syrian regime, however, is the party who has perpetrated most of these crimes since March 2011, where the Syrian regime has been responsible for up to 83% as it waged a systematic war on media work, committing hundreds of violations against journalists and citizen journalists, including killing, arrest, and torture in an attempt to conceal the human rights violations that the Syrian people are being subjected to and hide the crimes against Syrian citizens. According to the report, ISIS, factions from the armed opposition and Self-Management forces resorted to suppressing views as a policy in their areas of control as seen by the wide arrests they made. The report stresses that a journalist is a civilian individual according to the international humanitarian law regardless of their nationality. Any attack deliberately directed against a journalist is considered a war crime. However, when a media worker gets close to action-heavy zones, they are responsible for their own actions where targeting them in such case would be seen as collateral damage. Also, they would lose the right to protection if they were involved in hostilities. According to the report’s methodology, a citizen journalist as anyone who plays a significant role in reporting and publishing news. He is not necessarily impartial as a journalist should be. In case a citizen journalist bore arms and was directly engaged in hostilities, he would be no longer deemed a citizen journalist whereas it is possible that he would be referred to as a citizen journalist again, provided he retires completely from military action. This report draws upon, firstly, on the daily, ongoing documentation and monitoring efforts by SNHR team, and on accounts from survivors, eyewitnesses, and local media workers. The report contains —- accounts that were collected through speaking directly to eyewitnesses, and not cited from any open sources, in addition to analyzing a large number of the videos and pictures that were posted online or were sent by local activists. According to the report, November saw continued harassment and persecution in the north by the dominant parties for the fifth consecutive month, accompanied by assassinations, bombings and kidnappings that contributed to creating a climate of terror, and destabilizing the security situation which the community in these areas desperately needs to maintain in order to secure many of its basic needs. 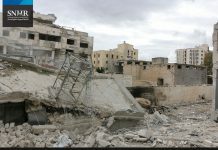 The report stated that media workers have been among the groups worst affected by this situation, with most of the violations documented as having been committed against them in November taking place in northern Syria. 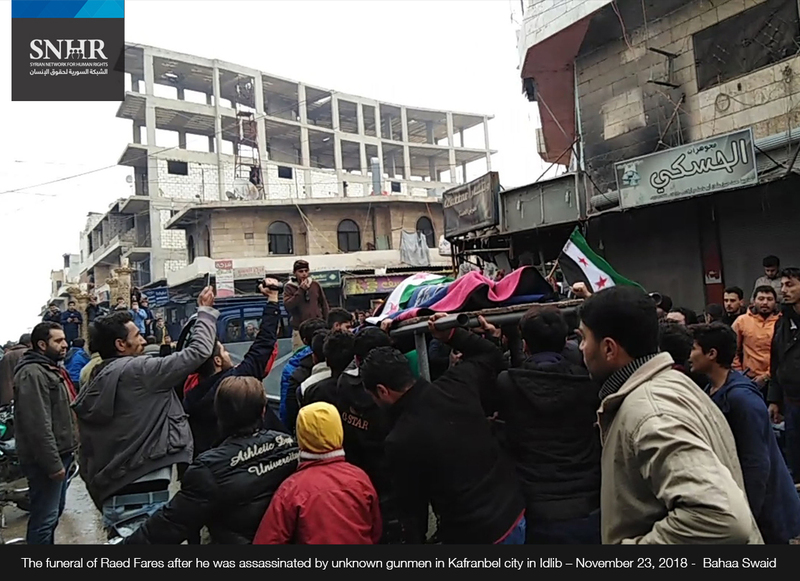 The report records that 24 media workers have been killed since the start of 2018, including two media workers were killed in November by Hay’at Tahrir al Sham. Also, the report documents that three media workers were injured in November, including one at the hands of Hay’at Tahrir al Sham, and two by other parties. In addition, the report documents one case of arrest at the hands of Hay’at Tahrir al Sham, and two cases of arrest and release, one by factions from the armed opposition, and one by other parties. The report calls on the OHCHR to condemn the targeting of media workers in Syria and shed light on their sacrifice and suffering. 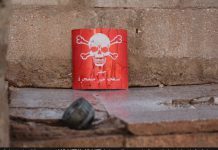 In addition, the report calls on the COI and the IIIM to launch investigations on the targeting of media workers specifically, considering their integral role in recording incidents in Syria, as the report emphasizes that SNHR is willing to cooperate and provide more evidences and data. Additionally, the report calls on the Security Council to fight impunity policies by referring the case in Syria to the International Criminal Court. Moreover, the report calls on the Arabic and international media institutions to support their colleagues in the field of media by publishing periodic reports that shed light on their daily suffering and memorialize their sacrifice. Also, they should contact their families to console them. Finally, the report stresses that all parties have to respect the international humanitarian law in their areas of control with respect to the protection of civilians and especially media workers and their equipment.